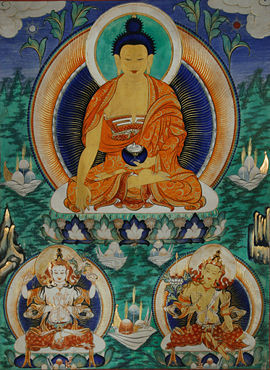 A Thangka depicting Shakyamuni Buddha flanked by Chenrezig and Manjushri. A "Thangka," also known as "Tangka," "Thanka" or "Tanka" (Pronunciation: tänkä (the "a" as in the word "water;" the "g" is silent)) (Tibetan: ཐང་ཀ་, Nepal Bhasa:पौभा) is a painted or embroidered Buddhist banner normally hung in a monastery or a family altar and occasionally carried by monks in ceremonial processions. Originally, thangkas (sometimes called a scroll-paintings) became popular among traveling monks because they were easily rolled and transported from monastery to monastery. These thangkas served as important teaching tools depicting the life of the Buddha, various influential lamas and other deities and Bodhisattva. One popular subject of Thangkas is "The Wheel of Life," which is a visual representation of cycle of suffering (Samsara). While regarded by some as colorful wall hangings, to Buddhists, these Tibetan religious paintings offer a beauty, believed to be a manifestation of the divine, and are thus revered forms of sacred art. In Tibetan the word 'than' means flat and the suffix 'ka' stands for painting. Thangka perform several different functions in Buddhist ritual practice. Devotional images act as the centerpiece during a ritual or ceremony and are often used as mediums through which one can offer prayers or make requests. Thangkas are used as a meditation tool to help bring one further down the path to enlightenment. The Buddhist Vajrayana practitioner uses the image as a guide, by visualizing “themselves as being that deity, thereby internalizing the Buddha qualities.” Images of deities can be used as teaching tools when depicting the life (or lives) of the Buddha, describing historical events concerning important Lamas, or retelling myths associated with other deities. 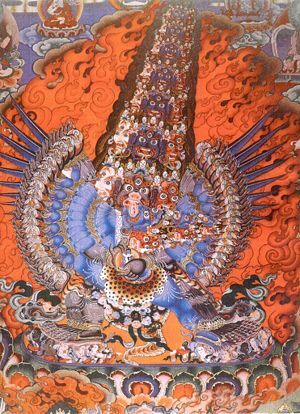 Tibetan Thangka of the Hayagriva. 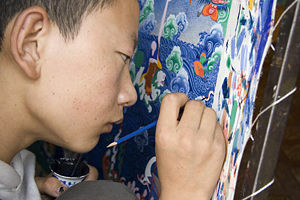 Based on the techniques and materials used, thangkas can be divided into two broad categories: those which are painted and those which are made of silk, either by appliqué or with embroidery. Thangkas are painted on a flat surface on cotton canvas or silk with water soluble pigments, both mineral and organic, tempered with a herb and glue solution—in Western terminology, a distemper technique. The entire process demands great mastery over the drawing and perfect understanding of iconometric principles. The composition of a thangka, as with the majority of Buddhist art, is highly geometric. Arms, legs, eyes, nostrils, ears, and various ritual implements are all laid out on a systematic grid of angles and intersecting lines. A skilled thangka artist will generally select from a variety of predesigned items to include in the composition, ranging from alms bowls and animals, to the shape, size, and angle of a figure's eyes, nose, and lips. The process seems very scientific, but often requires a very deep understanding of the symbolism of the scene being depicted, in order to capture the essence or spirit of it. Thangkas are made on various fabrics. The most common shape of a thangka is the upright rectangular form made out of loosely woven cotton produced in widths from 40 to 58 centimeters (16-23 inches). While some variations so exist, thangkas wider than 45 centimeters (17 or 18 inches) frequently have seams in the support. Thangkas can be rolled up when not required for display. ↑ Barbara Lipton and Nima Ragnubs, Treasures of Tibetan Art: The Collections of the Jacques Marchais Museum of Tibetan Art. (Oxford University Press, 1996). Art of Enlightenment: A persepective on the Sacred Art of Tibet. Yeshe De Project. Berkeley, CA: Dharma Publishing, 1987. Meulenbeld, Ben. Buddhist Symbolism in Tibetan Thangkas. Holland: Binkey Kok, 2001. This page was last modified on 23 November 2015, at 23:01.